I’ve always appreciated that Angie’s writing is so honest. I’ve been reading her blog since not long after her daughter Audrey was born and died hours later, and she’s always had this incredible gift to capture powerful emotions in her writing – and even better, she’s got an even bigger gift for bringing those emotions back to the Lord. Sometimes I get all kinds of caught up in what I’m feeling and trust me when I say I feel ALL THE THINGS and I spiral out of control with oh the emotion. In those moments, I need to be smacked in the face with a reminder that God is always bigger that whatever I might feel – because my feelings are quick and changing and varied, but the Lord is long-suffering and never changes and remains the same. Angie’s blog and books have always been a smack, a gentle smack but a smack nonetheless, in the face. Maybe you’ve never asked the question out loud, but you’ve wondered. You do the things that look good on paper: read your Bible, pray, attend study groups and go to church on Sundays. But you aren’t convinced you really know Him. Angie Smith understands, because she had run circles around the same paths searching for Him, frustrated at her lack of progress. And she probably would have continued to do so had it not been for one realization that changed everything. She wasn’t following God; she was trying to catch up with Him. And without realizing it, you may be as well. It’s a distinction that affects every aspect of our lives with Christ, and it begins with learning where we’ve relied more on man’s explanation of God than God Himself. So many requirements, so many rules, and so much guilt where there is supposed to be freedom. It’s the reason you wonder if you’ve measured up, and the nagging voice that tells you you’re a failure as a Christian. Three simple words changed everything for Angie, and she believes they can do the same for you. Honestly, when I first read what the book was about, I really struggled with the concept. 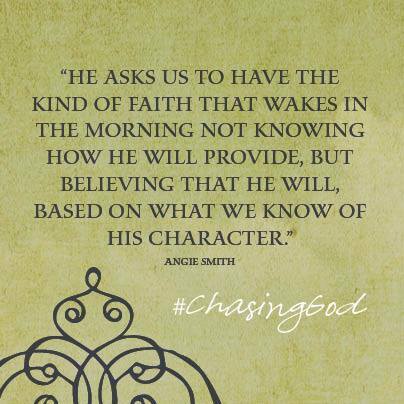 Isn’t chasing after God a good thing? 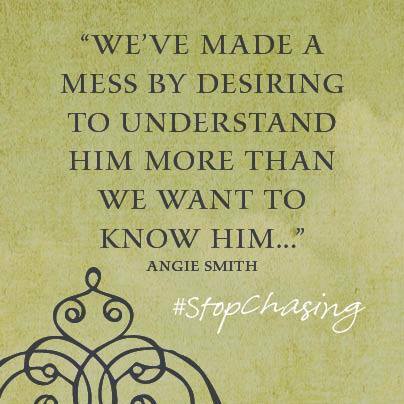 After all, if we are chasing Him, we are trying to get to Him. We are trying to know Him. And then I started reading the book and I realized exactly why it was not a good thing. Not a good thing at all. Because I have been bent over a Bible, looking at His words but not living them. My heart is one of an academic. I love school and books and learning and everything about education. And that is exactly where I realized I kept finding myself in the God-Krista relationship. I was chasing Him through texts and commentaries and sermons on podcasts. None of these things are bad by themselves, but my heart was in the wrong place. I wanted to master the content but not the Creator. God knew when He was doing when He designed my brain (well, that’s not really that profound). He gave me a love and thirst for words and for knowledge, but He didn’t give me a mind able to recall it after one go-round because then I’d never pick it up again. I’d chase Him until I mastered Him and then I wipe my hands off and smile and feel proud of conquering the subject. He gave me instead a mind that loves to learn but must read and reread and talk about things and reflect on them in order for them to sink in. THANK YOU, LORD. For knowing me much better than I’ll ever know myself. Because I know to know You, not just understand You. If that means reading and reading and reading Your Word repeatedly, then I’ll do it. 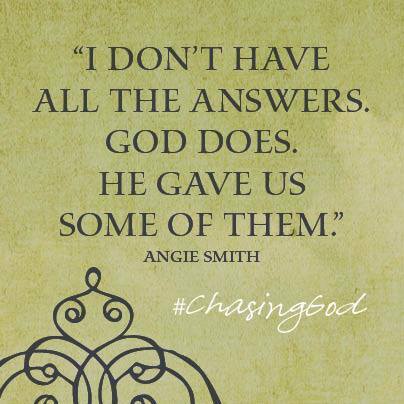 I think what really hit home the most for me as Angie’s writing unfolded is that for those who seek God, it’s often because we desire to know the answers when the reality is, our minds are finite. We are human, we are being sanctified, and He will only share with us what we need to know. Not all of it. What He sees fit. And Angie so succiently reminds readers that it is when we put aside the quest for factual knowledge and see to know, personally and intimately know, God — it’s then that we aren’t looking for Him but instead looking at Him. She clearly explains the difference — and I get it, I really do. Because my relationships with my friends would be so different if I only wanted to know the cut-and-dry details of them instead of spending time with them developing a relationship with them. Why should God be different? He should be my very best friend – and we don’t chase our very best friends. Here is the kicker for me: when I find myself chasing God, running breathless in an attempt to catch up to Him — it’s then that I’m relying not on faith but my own power. My power is weak and minimal but God’s is not. When I let go and walk with Him instead of desperately trying to catch up and maybe even beat Him, when my faith is resting firmly on who He is, who He will be — it’s then that I am most satisfied and at peace. Angie is truly a gifted wordsmith. This book would be incredible for a wide range of women, from those just beginning their walk with the Lord to those seeking to spend time together in a Bible study to accountability partners reading it together and discussing how they are chasing God in their own lives. 1. 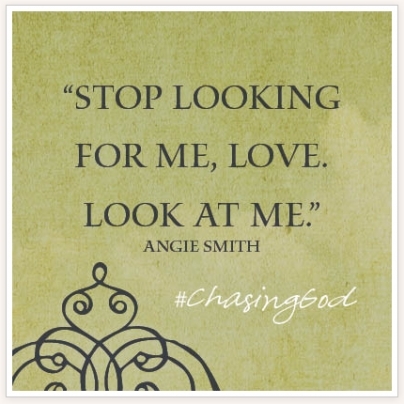 Leave me a comment telling me how you’ve seen yourself chasing God in your own life. 2. Tweet about the giveaway. I don’t care what language you use, just make sure you include to twitter handle (@kristaonpurpose) and a link to this blog post (here’s a shorter link: ) Leave me a comment with a link to your tweet. 3. Follow me on twitter (@kristaonpurpose). Leave me a comment with your twitter handle! Giveaway ends on Friday, March 7 at noon PST! Typical disclaimer: I was given an ARC of Chasing God for review purposes from B&H Publishers and Icon Media Group in exchanged for an honest, unbiased opinion of the book. All reviews are my own and I wasn’t pressured into a positive review – I just really loved this book!